We have sold hundreds of dress vests, and we listen closely to customer feedback to make sure we're delivering on the promise of unique, authentic clothing, world class service, and great prices. We survey every customer to gauge their opinion of the products they bought, and put together this list of the top-ranked dress vests in our store. Shop with confidence, knowing that these terrific dress vests have been tested and endorsed by our other customers, and that you will receive five star service along with a great value! I love this vest! It fits so perfectly and the quality surpasses the garbage that most mainstream sellers try to push. I wish I could just walk into a store and purchase high quality clothes like this. Thank you Gentleman's Emporium! THIS WAHMAKER VEST is top of the line in a well made, handsome and authentic vest of the period in time it represents! ~ It is a real "eye-catcher" that will not disappoint its wearer! ~ Best of all it's ....MADE IN THE USA!!! This was my first purchase from the Historical Emporium along with a satin silver puff tie and I have to say this exeded all expectations, the vest is very well made and is extremely light over all I love it. I will say this when I got it there where a few strings around the buttons but I was assured by a friend of mine who does a lot of tailor work that it was just the tie off point were they closed the stitching for the button holes. Well there is my " complaint " for this review and all it took to fix it was about two minutes with a small scissors and you couldn't even tell so all in all I give this 5 stars. Perfect purchase. Wore to Ragtime themed event and was very period appropriate. Perfect, perfect, perfect. So far, the different items I have purchased, the quality, service and shipping have been outstanding!!! Nice quality, wonderful look, great shipping time. Ordered late Tue night arrived Thur morning, regular mail. 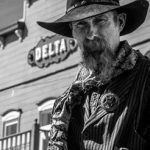 My husband needed a black and white vest for an event later this year during which we will be in historic costumes for a week at a time. This one is not just the best-looking option I could find, but fits well and is well made. He can remove his jacket with confidence; he'll still look well-dressed and period appropriate. 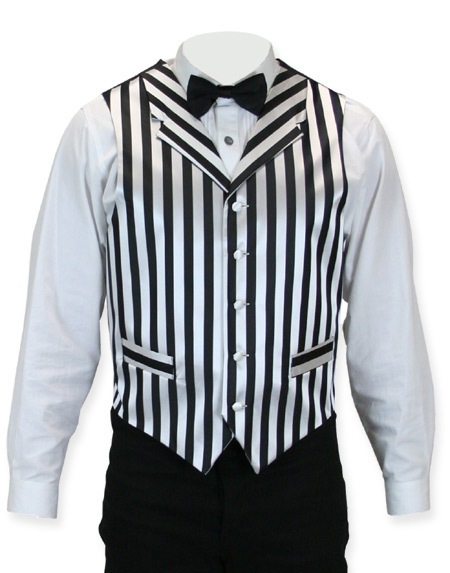 Bought this striped vest for a Night Circus themed party so everyone needed to wear black and white with a shock of red. This is the best vest I found over the entire internet to fit what I was looking for and the price is good. The product arrived very quickly and I was impressed with the quality for what I paid. The vest is thin, which is what I expected. I wont have to worry about overheating indoors. The fit was perfect when following the size guide. Absolutely loved it. I bought it for a theatrical production in our theatre. I like it so much I think I'll be purchasing one for myself. We love the vests and they arrived in a timely manner. They are of the highest quality and they're perfect for our barbershop quartet, The Apple Boys - Thanks! Love! love! Love!! Sassy, yet classy! Fits great, feels great! I got this one for a friend's wedding. The dress was red vests, black jeans, cowboy boots, and a white shirt. 4 out of 5 of us got our vests from this website and they looked great! Mine arrived in a large flat box so the item wasn't bent or folded. It arrived pristine. The vest was well made and beautiful. i will definitely be doing business here again given the quality of products and affordability. This piece really does look good, even though the pattern is a bit more garish than my norm. The fit is good, and pretty much spot on for the measurements in the sizing chart. It arrives with the pockets sewn shut, but they are there and easy enough to pop open with a few delicate snips. On the negative side, the pockets are pretty small, so if you actually use them, as I do, it may be a tight fit. A smaller handkerchief might alleviate some of the pocket issues, though. Finally, a modest critique is that while it looks great, the materials the waistcoat is made of feel rather cheap. Hopefully it will wear well enough over time, but this is not quite as nice as some of the other waistcoats I have purchased from the Emporium. But it is also less expensive than some of what I have purchased, too, so for the price it is still a good purchase. As with everything I have purchased from the Emporium Collection I'm very pleased. The compliments from others reflect the craftsmanship and style I have grown to expect. The only thing I might suggest is that additional colors need to be added. 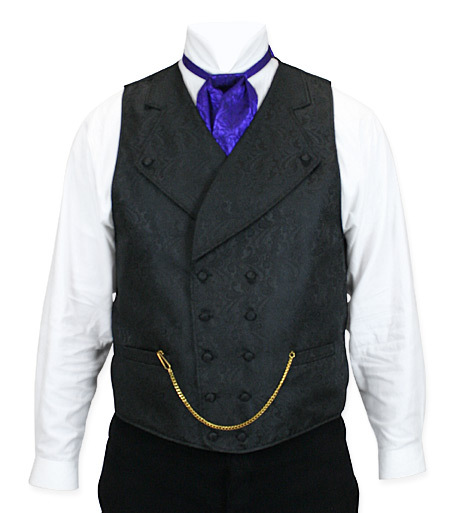 Silver, green purple (Showman Vest Colors) high lighted by the Black collar and Black pocket trim are naturals. Add a Gambler shirt and you are ready to go downtown. Another Winner! This a terrific addition to my formal wardrobe. It fits perfectly and the color is exactly what I wanted. The delivery was rapid and the vest is as advertised. Very good product. I will continue shopping here. This vest is a fabulous find. The price was reasonable and the fit is perfect. My husband and I are leaders in the Steampunk community and we will be purchasing at least one more in this style. Excellent product. Fits well. The only drawback is that the vest pockets are too shallow for a large pocket watch - they need to be deeper. Otherwise an excellent and elegant vest. I got this vest mostly because I needed a strapless vest that I could wear without having to constantly readjust it throughout the day. Once I got this vest I really liked the texture of the fabric, the style of the front (particularly the double breasted button pattern), and the ease of fit and use. 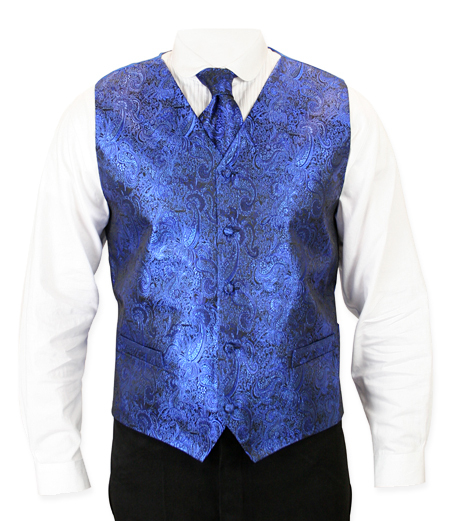 Definitely got a lot of complements and the price point seemed very reasonable for a vest like this, so I'd recommend it for anyone like me who likes to have a bit of formal wear that isn't too much of a hassle to use. If there is anything at all to the adage, "The clothes make the man. ", then THIS vest is probably what inspired it: the fit, finish, and quality of this garment is so far beyond my admittedly high expectations. The subtle jacquard pattern is very complementary with the red silk " puff" tie I also ordered. And the black-on-black striped lining is sadly unseen by anyone but the wearer. I've never owned a piece of clothing that fit so well, nor is more flattering to me. If you don't own one of these, you most definitely SHOULD! This vest is superb. The double breasted styling, wide buttoned lapels, and rich, subtle paisley brocade make this a knockout. Very nice quality, I only wish the pockets were real... I have pocket watch I was going to wear... The vest is well made and looks great! I highly recommend this item. Editor's Note: There are vest pockets, they are just sewn shut for transport. For a silver vest, the Klondike, the Montgomery, or the Showman all appeared to be quite similar so I based my decision just on the pattern visible in the closeup photos -- I liked this pattern best. 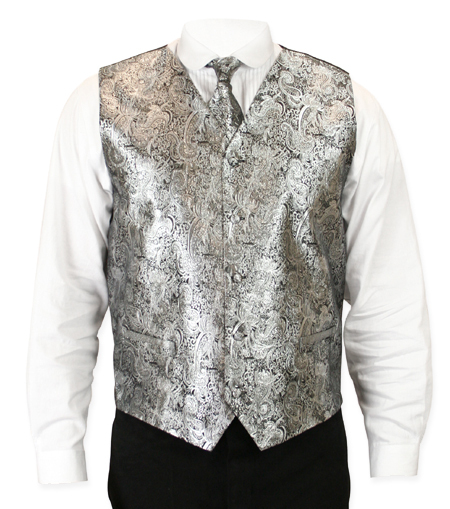 What I did not see from the photos was that this Showman vest is VERY metallic silver. I believe the others might be more satiny (which was what I imagined) rather than metallic. It's still a very nice vest, well made and the right fit, and I will still wear it -- but it's a bit "louder" than I was expecting. Love these items. Look great, good quality and quick delivery. As with previous items, I am very pleased. 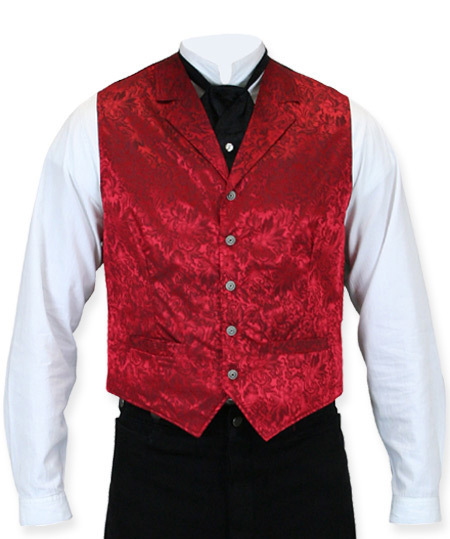 As an entertainer, I used this vest on christmas day, on stage. Very good looking in the light of the stage. Absolutely very handsome vests. The fit was perfect on both the small and mediums. Went very well with white shirts and bolo ties! The vest looks exquisite. Very classy, but still fits in at a SASS event. 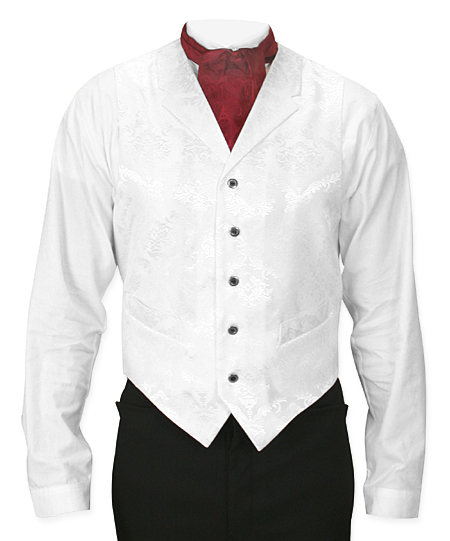 The color , the style and the fit really describes the name: Showman Vest! I love this vest! It's a birthday present from my Mom. I've already been asked by several people where I got it. Love wearing it to church when I sing special music. I have a substantial grey beard. This vest is suitable for my visits as Saint Nicholas' younger brother--his, ahem, younger, handsomer brother. A Santa Claus suit is a costume, a vest is clothing--and a step up in refinement from lighter weight vests I have worn. As an occasional performer of ragtime and kindred older piano, such a vest is expected. 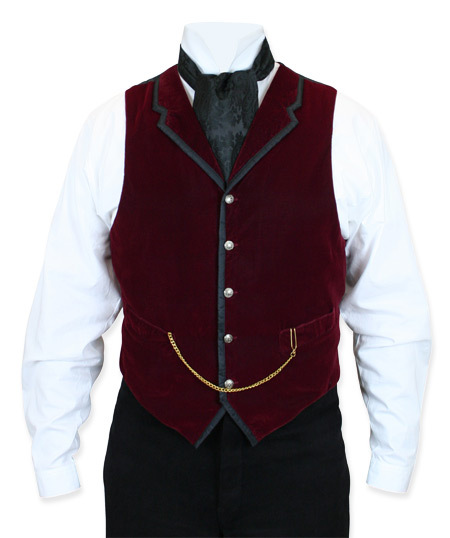 Of course for the role as a piano-playing Santa Claus, this burgundy vest is best. I am really enjoying this vest; it's comfortable and looks great. I have seen the real thing as I have worked at museums for a while and it definitely allows me to see what some of the vests would have looked and felt like when they were new 140 years ago. And yes I have received compliments on it! The pictures really don't do the waistcoat justice. The cut is superb, the texture is quite lush and the colour is rich and vibrant, and offset perfectly by the black trim. I wear this to work on a regular basis and it always gets compliments - works well with a black coat and trousers (I wear it with the Livingston brushed cotton trousers and the Victorian cutaway frock coat) and a white shirt for excellent contrast. One of my favourite items in my wardrobe - you'll probably find it becomes one of the favourites in yours, too. 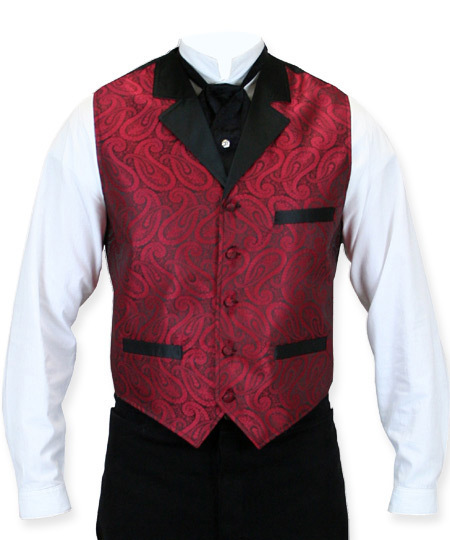 Wore this wonderful waist coat at the Edwardian Ball got several complements. The best part of getting this item is the wonderful outstanding costomer service I always receive. 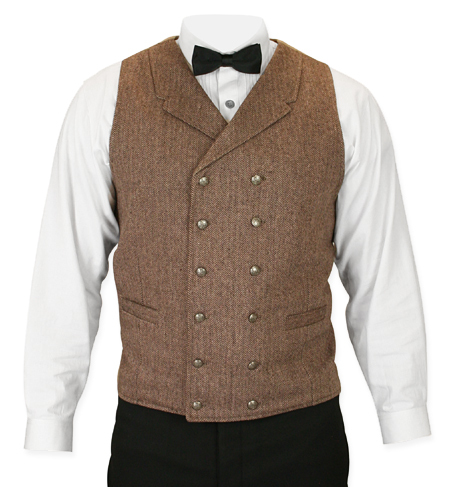 I bought this vest as I am getting married in December. 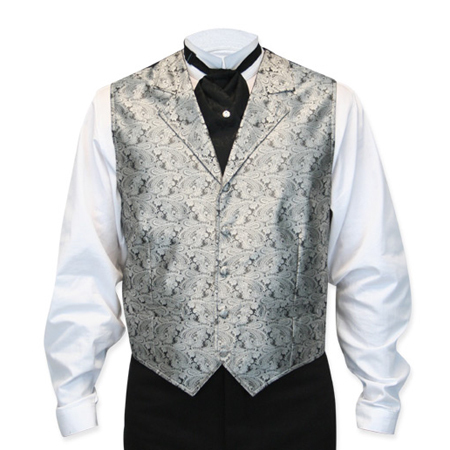 This vest fits well and looks great with the white tuxedo frock coat and pants I'll be wearing. Beautiful vest that is well made. Best purchase I've made,it's a beautiful pice of work,I love it. This is the seventh Vest I have purchased along with shirts, puff ties and hats over the years! This site matches my style and I have never been disappointed! Everything was better than I expected . Good product for the money . When I upgrade I will be back . Thank you so much your items are wonderful.